The ID card will include your name, your dog’s name and all pertinent information needed for identification. Why do you need a service dog ID card? You don’t, according to the ADA you are not required to carry any identification to prove your dog is a service dog. That’s the law, but if you want to travel without hassles, or embarrassment we do suggest that you outfit your dog in a service dog vest and carry a service dog ID card rather than argue the point or attempt to educate the person denying you entry. Your dog’s appearance, manners and attire such as a vest and identification will help you avoid public doubt and conflict. 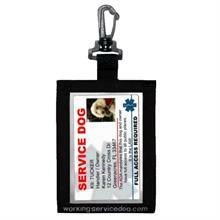 Our custom made to order PVC plastic ID cards will have your dog’s name and photo, your name and full address. Our ID cards are durable and are made of the same material as your credit card. Our service dog ID cards will be printed on both sides and will have the US Federal Laws printed on the reverse side. 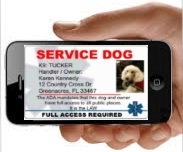 Personalized ID cards make it easy to identify your dog as a working service dog. You can carry the ID card in your wallet or in the window id pocket of the service dog vest. We do suggest two cards so you can hand one to someone when asked for identification.